YEMINA RIQUELME | URBAN ALLIANCE NORTHERN VIRGINIA PARTICIPANT Venture Philanthropy Partners invests in organizations that have the potential to serve more young people at a higher quality. The investment partnership with Urban Alliance built the capacity of the organization and helped to launch its High School Internship Program in Northern Virginia. This is the story of a Northern Virginia student who had an unforgettable experience through Urban Alliance and gained skills that will contribute to a successful career. When Yemina Riquelme moved to Virginia from New Jersey in the early fall of her senior year, she searched for an extracurricular activity that could fill her time and be beneficial to her future. When a counselor recommended Urban Alliance to Yemina, she instantly knew that she found the right activity. Knowing little about what to expect, Yemina began the High School Internship Program eager to find out what she would learn and how she could grow. After going through a training where she got an introduction to soft skills, such as how to behave during an interview and time management, Yemina began her internship at Virginia Tech’s Northern Virginia Center. Through her internship, Yemina was given an opportunity to learn a technology skill set that is taking off in popularity and innovating fields such as medicine, design and construction – 3D printing. “When I started, I knew nothing about 3D printing, but with the instruction of an amazing mentor, I learned how to work the software and the machines on my own,” said Riquelme. Yemina not only mastered the skill of 3D printing, she gained the confidence to teach classes to the community. Learning about 3D printing also helped Yemina hone in on her dream career in graphic design. The skills that Yemina gained have even given her older sister confidence to hire her 19-year-old sister to help with advertising for her design company. 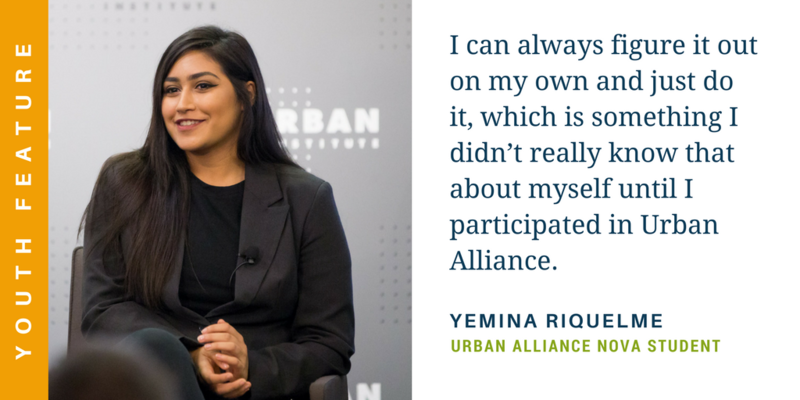 Yemina never would have guessed that her Urban Alliance internship would also introduce her to a lot of people who informally taught her about engineering, lab work and more. She acquired twice as much knowledge at her internship than she bargained for before she started. Yemina enjoyed her experience with Urban Alliance so much that she recommended the program to her brother, who will participate this year. Yemina now takes online design classes through a program that allows her to take courses from different colleges throughout the country. With her education and the workforce skills she acquired through Urban Alliance, Yemina plans to vigorously pursue a career in graphic design. Urban Alliance has equipped her with the skills that she needs to not only interview for her dream job, but also succeed in the workplace when she gets hired. So whether her career in graphic design takes her to New York or keeps her at her home of two years in Virginia, Yemina will always take what she learned through her Urban Alliance experience with her. “If I am given a task with little instruction, I can always figure it out on my own and just do it,” said Riquelme. “I didn’t really know that about myself until I participated in Urban Alliance, and I know this experience will carry out in the future. To learn more about Urban Alliance and our investment partnership with the organization, download our recently published case study.